There are many mixing and mastering plug-ins on the market today, but users often have to make a difficult choice between price and features. To me, IK Multimedia’s $500 T-RackS 3 Deluxe delivers on both. 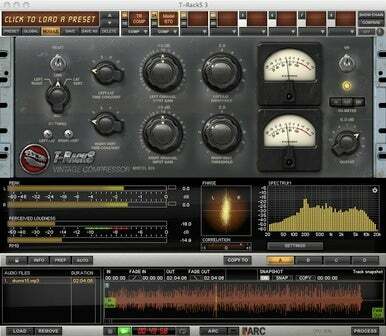 T-RackS 3 Deluxe contains three compressors, three equalizers, two limiters, and a clipper. There are a total of eight banks to place any of the plug-ins—four single banks and four double bank—which means that you can put up to 12 plug-ins on a single channel. The Fairchild Compressor in T-RackS 3 Deluxe. But here’s the real beauty of T-RackS—it lets you use four separate channels. That means you can test out four separate signal chains without radically changing something that works. For example, let’s say you have a mastering signal chain set up, but you want to try something different to make the drums pop a bit more. Instead of adding another entire plug-in set, you can just switch from channel A to channel B while the music is playing. It gives you the ability to instantly A/B your settings. But that’s not even my favorite part of T-RackS 3 Deluxe. The best part is the metering section at the bottom of the interface. It delivers a lot of vital information, providing instant feedback for each change you make. This section gives you a peak meter, perceived loudness meter, RMS (Root Mean Square, showing the power of the audio signal over a certain time window) level meter, a phase scope, and a spectrum analyzer with peak, RMS, and averaging display. That’s a lot of info. In addition, you can change the peak meter levels to three different scales: -90 to 0db; -50 to +5db; and -60 to 0db. As you work your way through the mix, it is important to be able to zoom in on the peak meter to see your available headroom. T-RackS 3 and the Pultec equalizer. 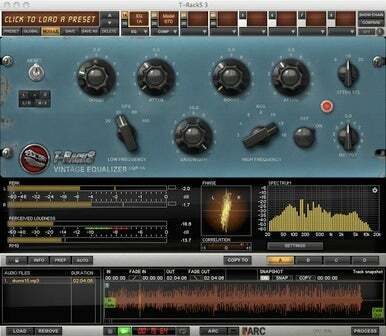 T-RackS 3 Deluxe includes two of my favorite plug-ins: models of the Fairchild 670 compressor and the Pultec EQ. These are new in the latest version of T-RackS and, for me, definitely worth the upgrade. There is one thing that I don't like about the interface—clicking on the name of the plug-in at the top of the interface turns it off instead of changing to that plug-in's interface. To change to the plug-in you need to click on the buttons labled 1A, 1B, and so on. Not a huge problem, but even after using the software for quite a while, I still make the same mistake. You can use T-RackS in your digital audio workstation or as a standalone application. This way you can bounce out a mix and use it as a mastering tool. At $500 T-RackS 3 Deluxe delivers a lot of bang for the buck, giving you the option of using modern or vintage sounding gear in your recordings.